I'm diving into my digital review pile again to write about a couple of releases that have intrigued me as I've listened to them more over the last few months. The first of which is the self-titled album from Boston (Massachusetts) black metallers Infera Bruo. This four-track album was first released digitally in mid 2011 before getting a CD release in January 2012. Infera Bruo have remained unsigned since their inception in 2009 ad have self-released this and their more recent album Desolate Unknown. Infera Bruo's members have been and are in many US extreme metal bands, most notably Trap Them and previous Unique Leader Records signees Pillory. They are big supporters of their local scene and the extreme bands within in. Needless to say with their integrity and work-ethic, a label should really take note and work with them to get their music out to wider audiences. Infera Bruo’s black metal is frosty and hellish, the metallic sound provided by the guitars and the cymbals adds to the icy atmosphere that the vocals create on opener The Devil’s Eyes. There are sections of melodic guitar and clean singing that show off Infera Bruo’s progressive side. These clean elements to their sound come as a real surprise when you first list to the band, but on subsequent listens they gets more and more warming. The production also allows the progressive moments to stand out amongst the blackened blasts, giving listener’s opposing textures that are moulded perfectly together. Upon Stone continues proceedings with more urgency, more blastbeats and some nice technical guitar work. The low-pitched spoken word heralds images of occult rituals and then out of nowhere, a simple punk-like rhythm from the drums’ provides an upbeat moment which takes you by surprise again. Infera Bruo’s music twists and turns, keeping you guessing but also hooked onto it’s every bar and note. 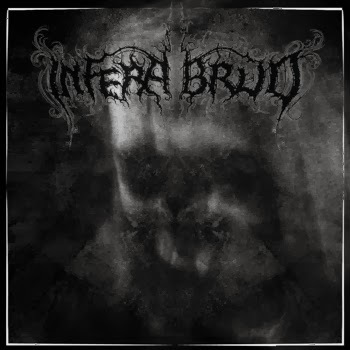 Infera Bruo makes use of synths within their black metal and they give it an occasional symphonic edge; however, they’re used sympathetically and don’t overpower the music. A Code of Will is the second on three songs on the album that pass the nine-minute mark and shows that Infera Bruo has propensity to write clever, intelligent songs that air more toward fans of forward-thinking and diverse metal, instead of to those looking for a quick-fix. This attitude reaps dividends, thanks to the quality of the song-writing and structures. If they’d just stuck to playing fast black metal, things may have become staid and dry, but with the changing time-signatures, the singing and the progressive talents of the band, they keep each song fresh and keep that momentum up throughout. The guitar work during A Code of Will illustrates that point, by being creative and yet still maintaining an element of menace. Infera Bruo feels like a band that could explode in any direction with their music and A Path Unwritten highlights that fact. On the face of it, it makes use of their raging black metal dynamics and artistry to create something dark and downbeat, before the melodic side of the band enters the fray and opens up a pocket of light which was present in their previous songs. It brings solace and comfort to the ears, even though you know it will soon disappear again behind the extremity. The guitar during the clean sections, creates some really intricate bluesy textures that belay that extremity. The more you listen to album, the more that reveals itself and that’s a sign of how good this record is. You pick up something new each time you press play. There’s not really much more that needs to be said about this self-titled debut, other than it’s the perfect place to start if you’re unfamiliar with the band. It’s accessible but extreme at the same time. it will appeal to a broad range of metal fans and thanks to it’s quality, it puts Infera Bruo up their with their more established peers. Somebody snap these dudes up for a release, or I will! You can purchase Infera Bruo digitally from the band's bandcamp page above.